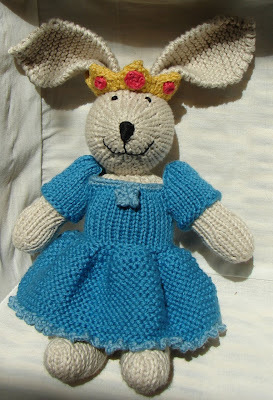 Auntie Em's Studio: Happy Fourth Birthday Sophie! This was the first outfit that I made. I'm probably still going to add some sort of accessory... maybe a straw hat. After making this dress, I found out that her party would be fairy princess themed. So, I decided to make a crown and soon will make a wand and possibly fairy wings... we'll see. The last outfit looks more like something she could wear to school. 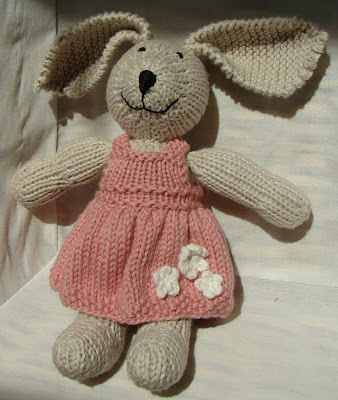 I made a pink cowl similar to the one the bunny is wearing for Sophie for Christmas last year and she wore it for months on end. 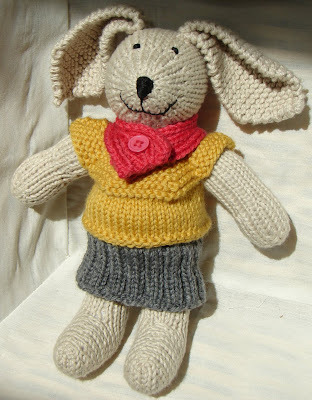 I thought it would be fitting for the bunny to have a matching cowl. I also think the bunny probably needs some cute mary janes to complete the outfit. That may be a bit of a challenge. Well, off to knit some more accessories! I'm so amazed at how adorable these outfits are!! !